Kevin Mackiewicz is a senior executive with a proven track record of success in marketing, strategy and sales management. Mr. Mackiewicz began his career with Wells Fargo, where he rapidly and sequentially progressed from Intern to Branch Sales Manager II. In 2008, he transitioned to Fifth Third Bank where has served in a variety of positions including, AVP & Licensed Financial Center Manager II, AVP & De Novo Marketing Manager, and VP & Senior Marketing Manager. 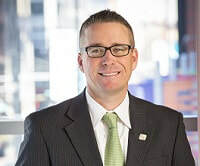 Currently, he serves as the Vice President and Head of Mortgage Marketing for Fifth Third Bancorp where he leads the marketing discipline for the Fifth Third Mortgage Company. Mr. Mackiewicz is a graduate of the University of North Florida with a Bachelor’s Degree in Business Management and has a Master’s Degree in Business Administration from Saint Leo University.